AccuShred is proud to announce that we are one of a limited number of information security companies nationwide to be authorized as a distributor for an Information Destruction Policy Compliance Toolkit. 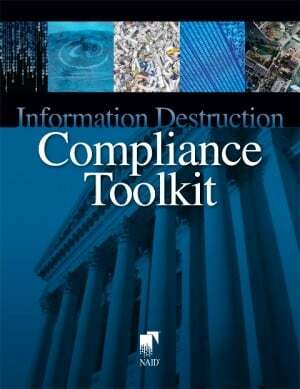 The “Toolkit” is designed to help organizations develop written information destruction procedures now required by law. According to the National Association for Information Destruction (NAID), many organizations in the US report they currently do not comply with this requirement and, therefore, are at risk. The Toolkit is the first publication to specifically address information destruction policy development with a goal of making compliance with the laws easy and understandable. Prior to authorizing a NAID Member representative to use the toolkit with organizations, NAID requires that they first become oriented in its use. Only individuals who have completed the orientation are permitted to distribute it. For more information on the NAID Information Destruction Compliance Toolkit, e-mail us at sales@AccuShred.net or call toll free (800) 747-3347.